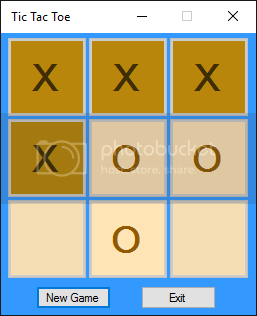 This is a simple two player tic tac toe game written using C#. When the game start, player 1 start by clicking on a empty box. Each player takes turn until someone win or the game draw. Player 1 is automatically assign X and player 2 is assign O. As i said before this is a simple game, the game has two button. New game button which resets the game and Exit button which quits the game. Feel free to extend the game in any way you want. Good Luck!